With bumper-to-bumper traffic and frequent collisions on State Route 347 making it the hottest topic for Maricopans, there are plans afoot to study improvement alternatives to the roadway in both Pinal and Maricopa counties. 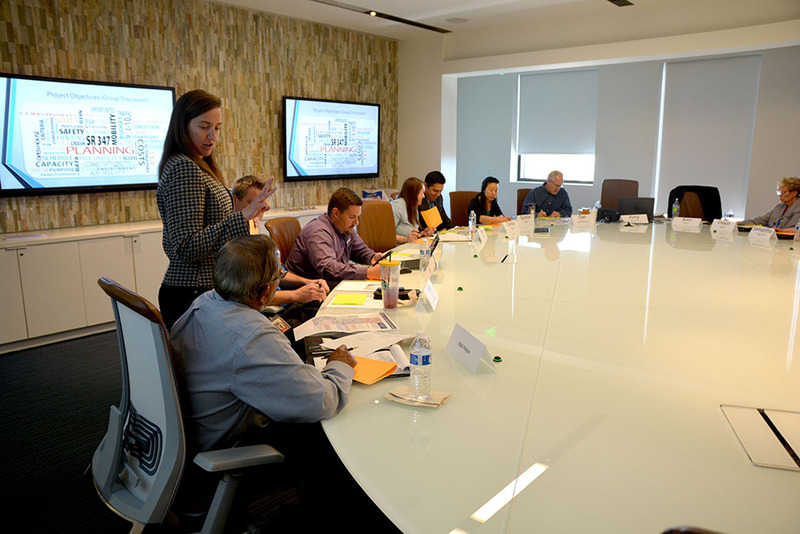 Monday, representatives of the City of Maricopa met three hours with counterparts from Pinal County, Arizona Department of Transportation (ADOT), Maricopa Association of Governments (MAG), Federal Highway Administration and Wilson & Company to kickoff the studies. “This study is just so important to this area,” said Charon Hill, MAG project manager. Amy Moran, senior project manager for Wilson & Company, which has completed transportation studies for the City of Maricopa, said the purpose of the studies is to develop alternatives and evaluate strategies. Alternatives named by residents include adding lanes and building overpasses. Ken Smith of HDR said the current realities of SR 347 will stymie economic growth in the area. Andy Smith, general manager of Pinal Regional Transportation Authority, updated the group on the current lawsuit aimed at the funding of voter-approved improvements. The Goldwater Institute sued the Arizona Department of Revenue, Pinal County and PRTA on behalf of the Arizona Restaurant Association over Prop 417, which passed in 2017 as a sales tax to fund transportation projects. Though the Arizona Tax Court ruled in favor of the ARA, the PRTA has submitted its paperwork to the Arizona Court of Appeals and is awaiting response from the Goldwater Institute. Meanwhile, the county is still allowed to collect the tax, which has brought in about $13.6 million. Smith said that was within $100,000 of expectations. Moran said the new studies are meant to help build consensus on SR 347 decisions. “We recognize there have been a ton of studies done on this corridor,” she said. However, two invitees not attending the kickoff were the Gila River and Ak-Chin communities. Hill said she would make new efforts to get them involved in future meetings. That includes the next gathering, planned as a corridor vision workshop in April. Concerns voiced at Monday’s session included safety issues, future costs and maintenance, failure to align with what stakeholders and the public want, building to standard, educating the public, how long improvement will take to create and how long they will last. Carlos Lopez of ADOT noted activity on the proposed Interstate 11 is also expected in April with a draft environmental impact statement. David Maestas, transportation manager for the City of Maricopa, explained meetings on I-11 had been delayed until now by the government shutdown. Andy Smith said it was important to remember the possible impact on SR 347 of any changes to other corridors, whether it is Interstate 10 and its access roads or future roadways like I-11, which is expected to take southern Arizona to the west side of the Valley and up to Las Vegas.